“The Flintstone Kids” was one of Hanna-Barbera’s more well received entries in the “kid versions of adult characters” craze of the time. The series focused on the adventures of Fred, Barney, Betty and Wilma as 10-year-olds. Like most “kid version” series, “The Flintstone Kids” ignored what passed for continuity in the original series. The original series showed the gang first meeting each other as teens or young adults, and Mr. Slate’s implied to be older than Fred. In “Kids,” they’re all childhood playmates and friends who all attend the same grade school in Bedrock. The usual “Flintstones” Stone-Age hijinks ensue, of course, albeit on a grade-schooler level. Betty and Wilma are called by their maiden names in this series (“McBricker” and “Slaghoople” respectively). Among other characters created for this series include Fred’s parents, Ed and Edna Flintstone. Ed sounds like the adult Fred and works as a handyman; Edna looks like a female version of the adult Fred, and is a homemaker. Like all other Flintstones series, the show reflected whatever contemporary society of the time was like, Stone Age style. Hence, “Kids” gave us 1980s-style gadgets, culture, and so forth. We also saw a more ethnically diverse version of Bedrock. Philo was presented as the “brainy kid” of the gang. He often spent his spare time inventing various things or in the pursuit of knowledge. Hanna-Barbera gave a similar treatment to Buckwheat a few years earlier on the short-lived “Little Rascals” cartoon. Moonrock also served a similar role among the teenaged Pebbles and Bamm-Bamm’s group of friends. 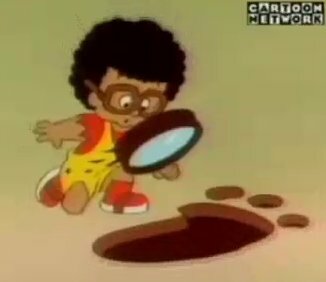 Philo wore glasses (the usual Flintstones-style wood-framed ones) and, unusually for the franchise, shoes. His father was Officer Bob Quartz, who worked for the Bedrock police department. Young Mr. Quartz made one further appearance in the normal Flintstones setting, in the 1994 holiday special “A Flintstones Christmas Carol.” Instead of working for the prehistoric version of IBM, however, Philo was a police officer like his father (but still a friend of Fred’s). Philo was voiced by Larry “Bumper” Robinson (who voiced Black Lighting on “Batman: The Brave and the Bold”), while Officer Quartz in the series was voiced by Buster Jones (the voice of Black Vulcan on the “Super Friends”). In “A Flintstone Christmas Carol,” Philo was voiced by Rene Le Vant. In case you’re wondering: a quartz is a type of mineral, often used as part of many types of modern timekeeping technologies. It’s particularly used in wristwatches, rendering the need to “wind one’s watch” obsolete. The quartz wristwatch was introduced to the public in the late 60s, and by the 1980s (when “The Flintstone Kids” was made) had become ubiquitous.